What you see is NOT the default but what I have it set to. Go through these settings, and get a feel for what they do! 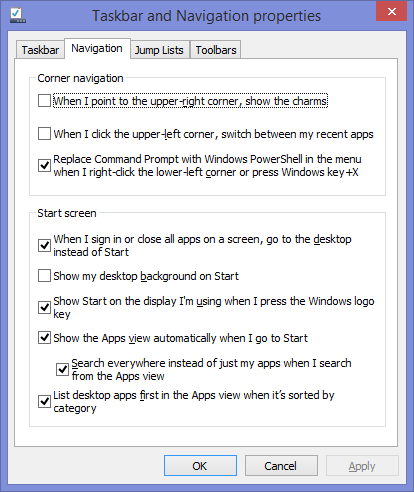 There’s the new “Navigation” tab in the taskbar settings. A very welcome change, finally. My favorite (reimplemented) feature is the ability to search all files, apps, and settings with a single gesture, when “search everywhere” is checked in taskbar settings. Results appear below the search field. When testing this, I found it odd that I would press the windows key, then results would appear below while the apps list would stay idle, so I poked around, and found that Windows-S serves the exact same functionality. No more searching by pressing “windows” and being distracted. Its all about the new streamlined Windows-S. Combo that with the “sign in to desktop” option, i’ll hardly see that screen now! Windows-S is 8.1 only. If you click the suggestions below the results, it’ll do a bing search for those terms in the bing app. The automatic search is a great addition as well, and what I had expected 8.0 to do before the change in direction to “Modern” apps.